Our company is highly rated in the field of manufacture, supply, wholesale, distribute, retail, trade and import of Single Port Wavecom Modem such as Wavecom USB Modem, Wavecom GSM and GPRS Modem, Wavecom Modem and others. We offer exclusive range of these modems to meet all demands of the customers. To add on, these are available at cost effective rates. Fastrack Supreme features an open-standard expansion card interface, enabling you to add additional IO connectivity or features like GPS, WiFi, Bluetooth, Zigbee and more. Use our expansion cards or develop your own – available cards include additional IOs, USB and GPS. »» CDMA2000® 1xRTT and AMPS technology. Supplied with Internet plug-in software key. Internet plug-in software key is comprised of TCP/UDP/FTP/HTTP/email components. »» Up to 7.2 Mbps HSDPA and 2 Mbps HSUPA with automated 2G/3G handover. We are the prominent company involved in the field of manufacture, supply, wholesale, distribute, retail, trade and import of Wavecom USB Modem. Reckoned for their optimum quality and easily installable nature, these modems are designed for a specific application of the AT command control system. These modems provide interface support as automatic bit rate, SMA antenna interface and down the SIM card memory. Apart from this, these cells are available at reasonable rates to our dear clients. Our company has gained wide spread reputation in the manufacture, supply, wholesale, distribute, retail, trade and import of Wavecom GSM and GPRS Modem. Available in customized range to suit the all requirements of our clients, these modems have maximum transmitting speed of 115.2 Kbps. These are made by using premium raw material by our experts who have great knowledge in this field. Finally these modems are offered at pocket friendly prices. Our company is among the best known companies which are involved in the manufacturing, supplying, wholesaling, distributing, retailing, trading and importing Wavecom Single Port Modem. Advanced technology and supreme raw material is used while making these modems. These have gained huge appreciation by our customers for their excellent designs and compact sizes. Moreover, these modems are based on Wavecom. 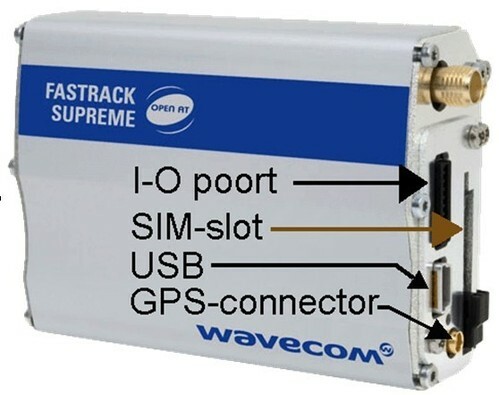 Our company has gained name and fame in the domain of manufacture, supply, wholesale, distribute, retail, trade and import of Wavecom Supreme Fastrack 20. The offered range of these fastrack 20 is developed and designed by our expert professionals utilizing high quality material with latest technique. These are available with dual band 900/1800MHZ and give maximum transmitting speed of 115.2KB/s. Apart from this, these have industrial designs and aluminum casing. Three expansion cards are available for the Supreme (IESM's - Internal Expansion Socket Modules). Our company engages in the manufacturing, supplying, wholesaling, distributing, retailing, trading and importing Wavecom Modem. Widely acknowledged for their easy functionality and high reliability, these modems are very useful for mobile voice, csd data, fax and sms communications. For users need to just insert sim card into the modem for functioning. In addition to this, these modems are tested in adverse conditions to ensure their outstanding quality. Packaging Details: By own of unitech. WAVECOM M1206B GSM MODEM data, fax, voice and messaging function on sale! »» RS-232 connections through a small mouth and Sub-D15 connector plugs audio. Design : Industrial design, Aluminum casing. Input voltage: 6V-36V DC. Input current: 1A-2A. Standby current: 56mA. Working current: 100-140mA. Accessories: For RS232 : AC/DC adaptor, RS232 cable, Antenna, 2 Mounting Plates, CD. For USB : USB Cable, Antenna, @ Mounting Plates. Open AT programmable : Native execution of embedded standard ANSI C applications. Custom AT command creation. Custom application library creation. Standalone operation. Standard : GSM : 900 MHz. E-GSM compliant. Output power: class 4 (2W). Fully compliant with ETSI. GSM phase 2 + small MS.
DCS : 1800 MHz. Output power: class 1 (1W). Fully compliant with ETSI GSM. phase 2 + small MS.
GPRS : Class 10. PBCCH support. Coding schemes: CS1 to CS4. Compliant with SMG31bis. Embedded TCP/IP stack (optional). Interfaces : RS232 (V.24/V.28) Serial interface supporting: Baud rate (bits/s): 300, 600, 1200, 2400, 4800, 9600, 19200, 38400, 57600, 115200. Autobauding (bits/s): 2400, 4800, 9600, 19200, 38400, 57600. General Purpose Input/Output gates (GPIOs) available. 3 V SIM interface. AT command set based on V.25ter and GSM 07.05 & 07.07. ® Open AT interface for embedded application. SMS : Text & PDU. Point to point (MT/MO). Cell broadcast. Data : Data circuit asynchronous. Transparent and Non Transparent modes. Up to 14.400 bits/s. MNP Class 2 error correction. V42.bis data compression. Fax : Automatic fax group 3 (class 1 and Class 2). Audio : Echo cancellation. Noise reduction. Telephony. Emergency calls. Full Rate, Enhanced Full Rate and Half Rate operation. (FR/EFR/HR). Dual Tone Multi Frequency function (DTMF). GSM Supplement Services : Call forwarding. Call barring. Multiparty. Call waiting and call hold. Calling line identity. Advice of charge. USD.